AMRO Chief Economist Dr. 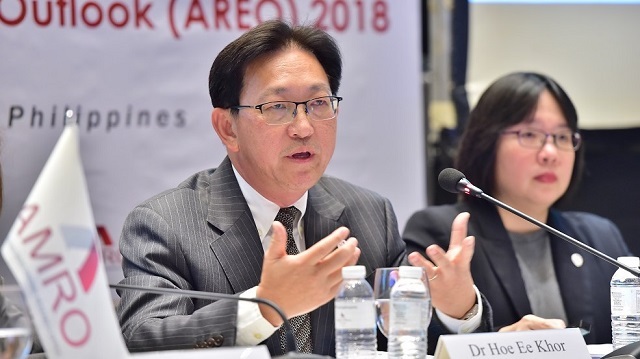 Hoe Ee Khor presents findings from AMRO’s flagship report, the ASEAN+3 Regional Economic Outlook 2018, in Manila, the Philippines. Headquartered in Singapore, ASEAN+3 Macroeconomic Research Office (AMRO) is the regional surveillance unit of the Chiang Mai Initiative Multilateralization (CMIM), a multilateral currency swap arrangement among ASEAN+3 (the 10 ASEAN members, China, Japan and South Korea) that seeks to address balance of payment and short-term liquidity difficulties in the region and to support existing international finance arrangements. In this first of a two-part interview, BRINK Asia speaks with Hoe Ee Khor, chief economist of AMRO, about the implications of increased protectionism on the regional economy, given that the ASEAN+3 region’s economic growth over the past few decades has been inextricably linked to trade. Additionally, given the increasing heft of emerging economies, he talks about their growing prominence in the global financial architecture. BRINK Asia: How have the ASEAN+3 economies navigated the ups and downs in global trade in recent years? Hoe Ee Khor: The region is one of the most open in the world, and very dependent on trade in particular, so trade is the lifeblood of regional economies. Manufacturing for exports is a strategy that has been followed very successfully in the region for many years and has taken many countries from being poor to being rich. Following the global financial crisis (GFC), demand from the U.S. and Europe collapsed, and the region had to rebalance toward more domestic demand. This was led by China—and quite successfully. The region’s economies managed to do so and continue growing at very healthy rates. The collapse in external demand following the GFC was a very big shock for the region and a reality check of sorts for the manufacturing for export strategy. As a result, we have seen intra-regional trade increasing rapidly, while extra-regional trade shrank. This continued till at least about 2016 or thereabouts, after which global demand started picking up again. However, just as this was starting to happen, the new U.S. administration started taking a hawkish view on protectionism and pushed for an expansionary fiscal policy. At the start of last year, the markets went haywire, and there was a pretty large outflow of capital from the region. But the regional economies managed somehow—the threats relating to trade did not materialize and the financial markets settled down. There was still a recovery in exports, led by an increase in capital expenditure as well as a boost in demand. So far this year, external demand has held up—we saw a very strong year of growth for the region in 2017, and that has continued into this year. BRINK Asia: In recent weeks, we’ve seen an escalation in trade protectionism measures—if these were to continue, what would the implications be on the region this time around? Dr. Khor: In recent weeks, trade conflicts have escalated. The U.S. has imposed tariffs on, among other things, automotives, steel, washing machines and solar panels and is threatening another round of tariffs. The big threat for the ASEAN+3 region is that external demand may collapse, as that has been supporting growth—so we are very concerned about that. In our flagship report, the ASEAN+3 Regional Economic Outlook 2018, we did a simulation of a limited trade war between the U.S. and China, and the result we got is that the impact of such a trade war will be fairly significant as it will shave off between 0.2 and 0.3 percentage points of growth in both these economies. What is worrying is that the spillovers on the rest of the ASEAN+3 region will be significant as well, as a result of global value chains that are very widespread. Therefore, a trade war between the U.S. and China also means a trade war with everyone else. Asia’s supply chains are among the most sophisticated and extensive in the world—the impact, according to our simulations, ranges from 0.2 to 0.8 percent of GDP in different countries in the region, depending on how open their economies are. Nevertheless, our simulation was, in some sense, reassuring because we don’t see a collapse or a recession in any economies, just a slowdown. A large part of that is because the models used in the simulation typically focus on the price effects, which results in a diversion of trade. Because prices are higher, consumers will consume less, or goods will be imported from elsewhere. So yes, we do expect a redistribution of trade from the tariff war. But I think a bigger concern is that all of this can have a secondary impact on the financial markets in terms of uncertainty; and it can have an impact on investment and capital expenditure. If we were to see a fall in exports, we could have investors looking to rebalance their portfolios and potentially pulling out from the region’s emerging markets. We feel that these implications could be more significant, although this is unpredictable. BRINK Asia: How are the region’s economies responding to this challenge? Dr. Khor: I think it is a bit too early to tell, but we have seen some reactions that are quite reassuring. Despite the rhetoric around tariffs and the like, we see that the Comprehensive and Progressive Agreement for Trans-Pacific Partnership has gone ahead without the U.S., and I think that is comforting as it suggests that there is strong support for multilateralism in the region and elsewhere. And then, there is the Regional Comprehensive Economic Partnership, which will also be a very significant trade pact when it is ratified by all members. So, what we see is that many economies are trying their best to stay together, and that is important. This is because during tariff wars, trade is diverted from one economy to another, so there can be a few economies that will actually benefit, but we are not seeing other economies trying to take advantage of this situation. More recently, the EU-Japan agreement is another indication that most countries are trying to uphold the multilateral system. In terms of macro policies being implemented at a national level, China is taking some stimulus measures in terms of fiscal and monetary policy to offset the adverse impact of the trade conflicts. Other countries in the region may unfortunately not have the same kind of fiscal and monetary space, and they will have to cut back on spending—for example, Indonesia is trying to limit the import of nonessential goods. Certainly, the imposition of tariffs is putting pressure on some economies in the region. But the effects are still manageable because countries have some space internally to offset the external impact. If the external conditions get worse, we could see a further tightening of expenditure, and that could limit growth. That said, compared to the impact on the economies seen after the GFC, the implications of this are going to be much smaller. BRINK Asia: With the increased prominence of institutions such as the CMIM/AMRO, the Asian Infrastructure Investment Bank (AIIB), the BRICS bank and the Belt and Road Initiative (BRI), do you see a more prominent place for emerging economies in the global financial architecture? Dr. Khor: I think that has already happened after the GFC—effectively, the G-20 is the main global economic body now, and not the G-7, and there are six Asian economies in the G-20. The G-7 comprised a small bunch of countries just talking among themselves. Following the Asian financial crisis of 1997, the G-20 was set up, and since the GFC, its prominence has increased substantially with the leaders’ summit. Along with that, the Financial Stability Forum has been elevated to the Financial Stability Board, which is more inclusive as it includes the larger emerging economies. The other development is that regional bodies are becoming more prominent. For example, China set up the AIIB, which has become a prominent multilateral institution, and the BRI is a significant initiative as well. Governments in the Asian region have come together to form the CMIM and AMRO, which has received stronger support from global bodies such as the IMF since the GFC. Regional bodies such as CMIM/AMRO complement the IMF. Following their experience at the time of the Asian financial crisis, Asian economies have been reluctant to seek financial assistance from the IMF, which is a risk because by the time they finally get to the IMF, it may be too late. The CMIM/AMRO provides a short-term temporary liquidity facility for economies that are hit by liquidity shocks. That’s a very useful role given the volatility in the financial markets. I think the CMIM/AMRO is a good example of how the governance and management of the global financial system are evolving. You can read the second part of the interview here.